In Isshinryu karate there are fifteen upper body basics taught utilizing a variety of hand strikes and/or blocking combinations, mostly from seisan-dachi, the system's workhorse stance. In basic 7 we step back, forward hand shuto block followed by a spearhand (nukite) to the solar plexus. It has been suggested by some that this basic be modified by either aiming the nukite to the more user friendly throat or removing the open-handed strike altogether and replacing it with a punch to the original target. I've seen my share of modified basics in my style before. I don't like this idea as it smacks of hubris. Usually the changes are not an improvement anyway. One high ranking Isshinryu instructor had the temerity to remove the founder's original 15 basics from the syllabus and replace them with his newfangled 10. Spearing soft tissue with the hand is the way to go. Also, open handed strikes can be the prelude to a block/grab. 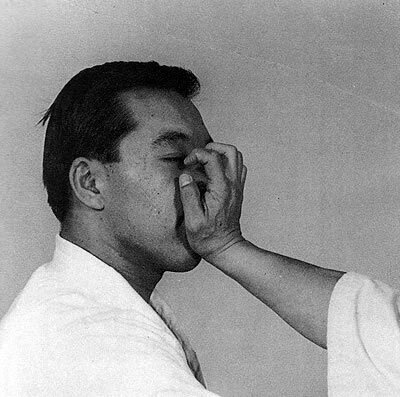 The kata Seiuchin provides a good example of applications utilizing both nukite and the open-handed block/grab variety. Unique to Isshinryu is the kata Sunsu which features a variant of nukite that's followed by tearing the skin away from the ribs and sternum. Now that's serious stuff. Obviously it's impossible to practice this on a willing uke with any sense of realism. The old-school masters of Okinawa no doubt had fingertips that could pierce cans and had grip strength like bear traps. Chojun Miyagi of Goju-ryu karate reputedly could tear the bark from a tree with his hands. These types of feats are rare indeed today. There are practical open-handed strikes that can be quite effective: palm heel, face rake and strikes targeting the eyes are not only potentially lethal but tend to be relatively safe for the user. This is really what separates the diluted "sportive" techniques from the martial variety.